Three Friends Can Band Together and Use Teamwork to Conquer Dungeons in Nintendo 3DS Game. It’s dangerous to go alone … so don’t! In The Legend of Zelda: Tri Force Heroes, available for the Nintendo 3DS family of systems on Oct. 23, three heroes must form a legendary trio to tackle dungeons and defeat bosses together as a team. Presented in the same top-down style as the critically acclaimed The Legend of Zelda: A Link Between Worlds, players solve inventive puzzles and dress Link in a range of outfits to enable new abilities that enhance their adventure. While playing the game with three players is part of the fun, the adventure can also be taken on solo, allowing all players to dive into the experience at any place and any time. Players can journey through the numerous levels of The Legend of Zelda: Tri Force Heroes in multiple ways. In addition to playing the game’s 32 stages across eight areas solo with two statue-like figures called “Doppels,” they can also play via local wireless or use a wireless broadband Internet connection to go online in multiplayer mode with two other heroic players who also own the game. Players can choose to team up with any combination of players who are or are not part of their Nintendo 3DS friends list. With Download Play, players can connect locally with two other friends who own a system in the Nintendo 3DS family, even if only one person has the game. Only by working as a team will players be able to progress through the various hazards awaiting them on their perilous journey. And by using fun emoticons on the touch screen, players not playing together in the same room can quickly and easily communicate with each other. The multiplayer Coliseum mode also lets players battle one or two other heroes, wearing the outfits that they have collected during their adventure. The adventure will take players through fiery volcanoes, icy caverns and beyond, with each new dungeon cleverly designed to be completed by three heroes. Cooperation is key. For the first time in The Legend of Zelda series, players can stack two or three Link characters on top of each other using a new Totem mechanic to solve multi-level puzzles and reach enemies’ weak spots. This new mechanic is one of many ways the three heroes can interact together to conquer the challenges that face them head(s) on. All three Link characters share the same heart gauge, so it pays to help each other. How players work together to clear each dungeon and reap the rewards is part of the experience! Collecting and changing outfits in the game is not just for showing off Link’s fashion prowess – each of the outfits in the game comes with its own special abilities that help the three Link characters solve puzzles and navigate difficult terrain. For example, the “Goron Garb” allows Link to swim in lava, while the “Kokiri Clothes” let him shoot three arrows instead of one. By switching between different outfits before entering a dungeon, all three players can bring vital abilities to each new area. Players can create different outfits using materials that they collect by completing the game’s levels. 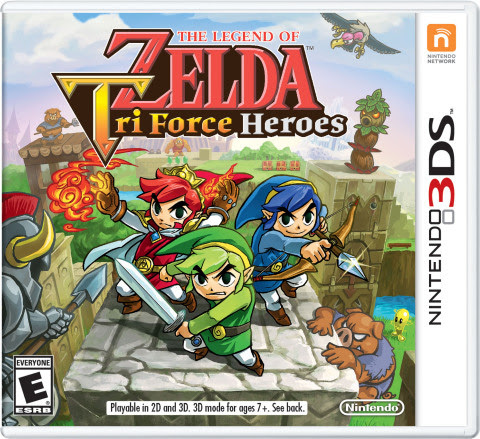 The Legend of Zelda: Tri Force Heroes launches in stores, in the Nintendo eShop in Nintendo 3DS and at Nintendo.com on Oct. 23 at a suggested retail price of $39.99. In addition, a Hyrule Edition New Nintendo 3DS XL system will launch exclusively in GameStop stores on Oct. 30 at a suggested retail price of $199.99. The system (which does not include the game) is gold-colored and features an intricate Hylian Crest on the front.